"If you're a musician who cares passionately about the sonics of your first-ever vinyl release, what steps can you take to ensure that the record sounds as good as possible? Here's one option: record the music to tape, buy your own cutting lathe, master directly from the original tapes, actually participate in the cutting process, and plate and press the vinyl at Quality Record Pressings. Gillian Welch and musical partner David Rawlings took those steps, and the process, though fraught with delays and very expensive, ended up being worth it. On these duets that feature both Welch and Rawlings on guitar and vocals (with Welch singing lead), the songs resemble short stories where the singer is fully invested in the characters, and the unfiltered lyrics that cut close to the bone fit the stripped-down and intimate sound of this LP. A black noise floor allows the detail and timbre to come through fully, and the delicate interplay between the guitars on what are mostly first or second takes gives the music an in-the-moment feel. Kudos to Welch and Rawlings for sticking their necks out and taking the DIY approach all the way." — Music 4/5, Sonics 5/5, Jeff Wilson, The Absolute Sound, December 2017. Plated and pressed at Quality Record Pressings! 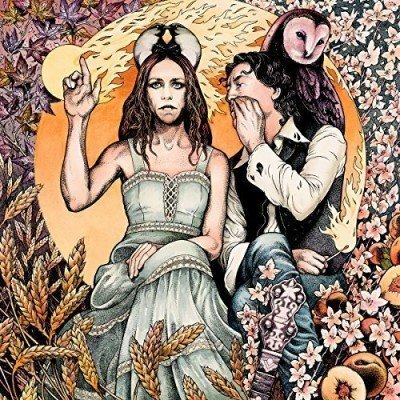 The title -- The Harrow & the Harvest, Gillian Welch's first album of new material in eight years -- reflects a creative drought: she and David Rawlings simply weren't writing songs they liked. The music is steeped in the early country, bluegrass, and Appalachian mountain traditions that are her trademark --though it engages rock and roll and blues motifs albeit acoustically--while the melodies and lyrics reflect the darkness and melancholy of Gothic Americana. Produced by Rawlings, this set returns to the sparse instrumentation of her earliest recordings: guitars, banjos, harmonica, and hand-and-knee slaps. The album illustrates a near-symbiotic guitar interplay; rhythms, melodies, and even countermelodies are exchanged organically, interlocked in the moment. The protagonists in these ten songs are desperate, broken, and hurt individuals; some stubbornly cling to shreds of hope while others resign themselves to tragedy even as they go on; still others, like the one in the opener "Scarlet Town," reflect anger and the wish for vengeance. What they hold in common is their need to tell their stories through Welch's plaintive contralto. "Dark Turn of Mind," a painful love song, embodies the truth in confessing the past as a warning even as its subject wills a new future. "The Way It Will Be," a fatalistic folk ballad, is the first of three songs with the words "The Way..." in their titles; its line "You've got me walking backwards/Into my home town..." sum up each of their sentiments, albeit in different ways. "Tennessee" is among the finest songs Welch has ever written. A sultry, darkly sexual ballad that has more in common with rock than country in its musical framework, its subject is conflicted between learned morality and an instinctive desire that expresses no need for redemption: "I kissed you cause I've never been an angel/I learned to say hosannas on my knees...I always try to be a good girl/It's only what I want that makes me weak....Of all the ways I've found to hurt myself, you may be my favorite one of all...."